I’ve been repairing and restoring clocks at my current address in Tankerton since 1996 when my wife took over the antique shop that has been trading there since 1985. Originally I was working solely on my own stock since 1989 from a private workshop, preparing clocks for sale at specialist clock fairs I attended both in London and the Midlands and to the local clock trade. I had attended evening classes in clock repair for enthusiasts, and then completed an excellent internationally recognised three year distance learning course, all the while expanding my knowledge and grasp of the subject. At this point, the opportunity came to study horology under an extremely experienced tutor, in one of the last colleges to teach the subject to qualification level, where at the end of the three year course I passed all my exams. I have subsequently been awarded the internationally recognised MBHI – Member British Horological Institute. With the constant increase in the interest in quality clocks, I moved part of my workshop to the shop in order to combine an in~shop presence offering advice to prospective purchasers with ongoing preparation of stock. Word then got around locally that there was a clock repairer in the town with High Street premises and the enquiries for servicing grew. 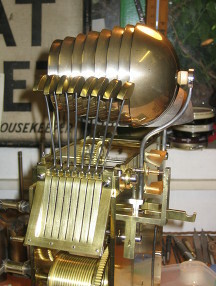 The decision was made to concentrate more on the servicing repair and restoration of customers clocks, with a selection of clocks available for sale. I now have customers from all over Kent and South East London and as far away as the north of East Anglia, and the Isle Of Wight. I also regularly repair clocks for a client in Switzerland! 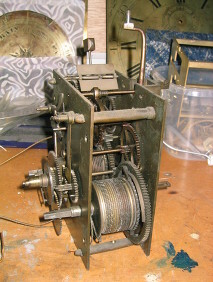 I repair old and antique clocks, and good quality modern clocks, with the occasional barometer for good measure. I have a very well equipped workshop and can manufacture almost any part I need in house including wheels. This keeps costs down and the quality up and ensures that any part needed can be made from suitable materials in a manner that matches the original. I have repaired many hundreds of longcase & fusee clocks along with hundreds if not thousands of French clocks and carriage clocks, from the humble timepiece to quarter chiming Grand Sonnerie. Each clock is judged on its own merits and receives a considered approach that preserves and conserves the originality of the item while achieving a repair that is both sympathetic and effective. Whilst the ubiquitous “Napoleon Hat” is rarely ever described as either valuable or high quality I find that I almost always have at least one in for repair – they seem now to occupy a place in many peoples hearts and minds as a feature of their childhood ; grandparents all seem to have had one and a great many have survived years of neglect . 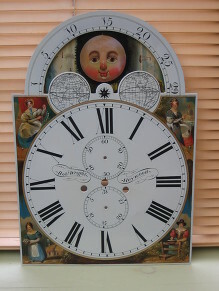 These clocks are not cheap to maintain or bring back to life, but compared to the cost of buying a modern mechanical clock with no sentimental attachment it can make much fiscal sense. All my work is guaranteed. Where it is at all practical I like to deliver and set up a newly serviced or sold clock in order to make sure that everyone is happy – you, me and the clock. Estimates and advice are free. Now more than ever the satisfaction of the customer is paramount and I am always pleased to see customers return after their clock has given them years of trouble free service. 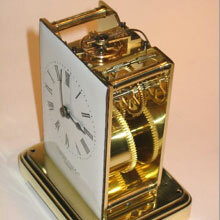 I have been repairing and restoring clocks in Whitstable for over 25 years. All aspects of clock repair and restoration are undertaken. Estimates as required. Ioffer a comprehensive case repair service including wooden cases. Once repaired I will happily bring the clock back to you to ensure its safety. If your painted dial has faded over the years I have access to master craftsmen who can help restore it to its former glory.